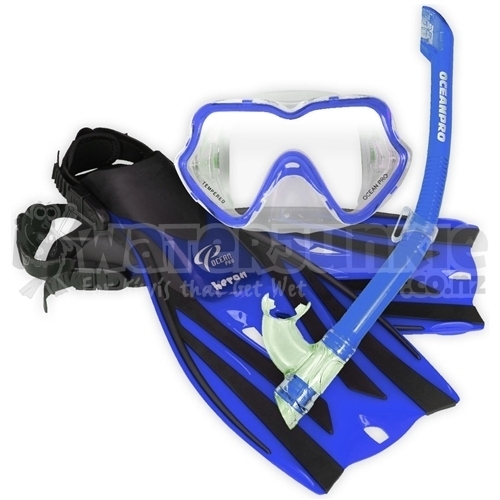 The Ningaloo Mask is a Quality Silitex Silicone Rubber Mask for a Comfortable Fit. This Double Feathered Edged Skirt Mask with Safety Tempered Single Lens has a Wide Field of Vision and an Easy to Reach Nose Pocket for proper Ear Equalization. Mask has a Medium Volume Design. The Grommet Snorkel features a Comfortable Mouthpiece with Secure Bite-Tabs and is equipped with Easy Adjust Snorkel Keeper for attachment to the mask. The Grommet Snorkel also features a Purge Valve for easy clearing of any water that might enter through the Semi-Dry Splash Top that keeps wind spray and splash away from the breathing tube. The Fins are an Adjustable Open Heel Snorkeling Design that delivers Comfort and Power. The Comfortable Foot Pocket will give hours of Snorkeling Fun. The Fin Blade is manufactured from a Composite Material that Flexes to Channel the Thrust Directly behind the Snorkeler for Maximum Performance in the Up and Down Stroke. The Fin Straps are equipped with Easy Adjust Buckles with Push-Button Release for ease of donning and doffing. Available in 3 color choices of Blue, Pink or Sea Mist.